Retro meets modern. 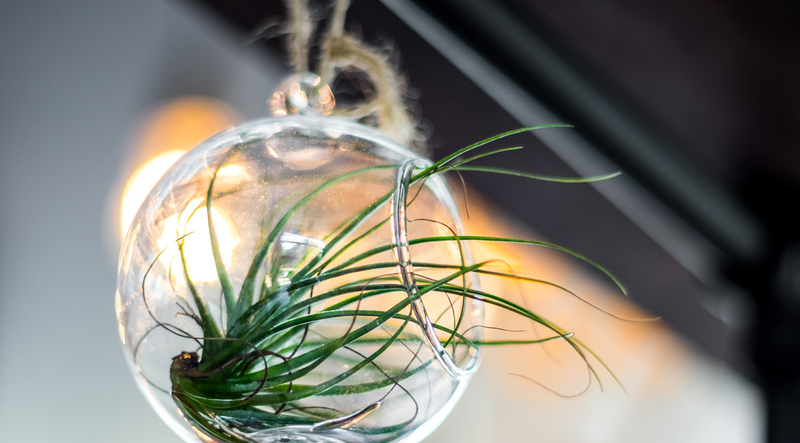 Get creative with plants in your living spaces. Here’s a few tips to get you started. Choose a glass container that compliments your interior space. Your plant selection must have similar environmental needs eg. light and moisture. Sun-loving plants need an open terrarium. Plants that require high humidity need a closed container. 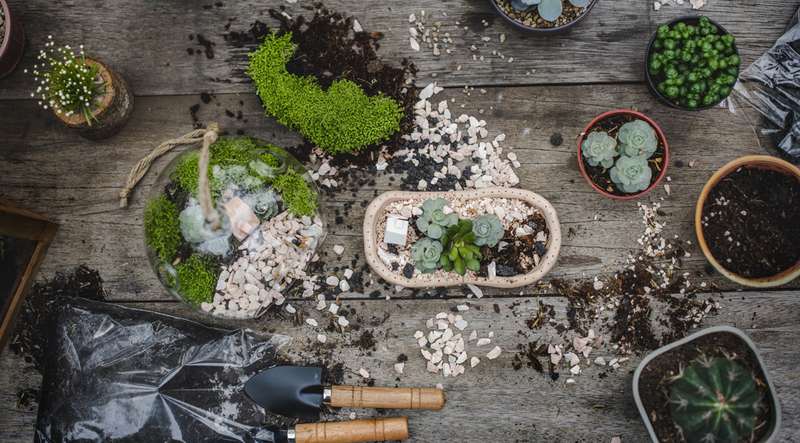 Carefully clean the terrarium before use (to prevent bacteria growing). Open: These terrariums can tolerate some direct sunlight. However, too much sun may burn the leaves of the plants. Closed: These terrariums need bright light, but no direct sunlight. Direct sunlight increases the temperature inside the container and literally cooks the plants. Step 1 Drainage: Crushed river gravel is pretty and works well as a drainage layer. Step 2 Charcoal: Place a thin layer of charcoal over the drainage layer. This will help keep the soil fresh and odour free. Step 3 Soil: The kind of soil used will depend on your selection of plants. Step 4 Landscaping: Choose slow-growing plants and do not overplant. Tip: A new terrarium should be placed in shade for about a week. Then adjust light to the requirements of the plants. Remember, most terrariums do better in diffused or filtered light. Open: Always test the soil before watering. For plants that like moist soil, the top soil should be barely moist. For cacti and succulents, the lower soil should be barely moist. Closed: These should rarely if ever need water. Ferns, mosses, baby’s tears, hypoestes, fittonia, ivy, peperomia, sanseveria, schefflera. Cacti, succulents, including jade, aloe, borro’s tail, earth stars, echeveria, haworthia, sedum. 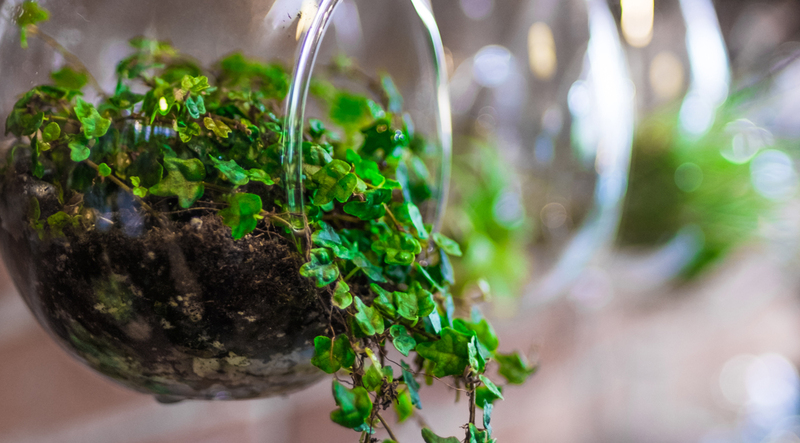 Creating terrariums are a great way to relax and have fun. 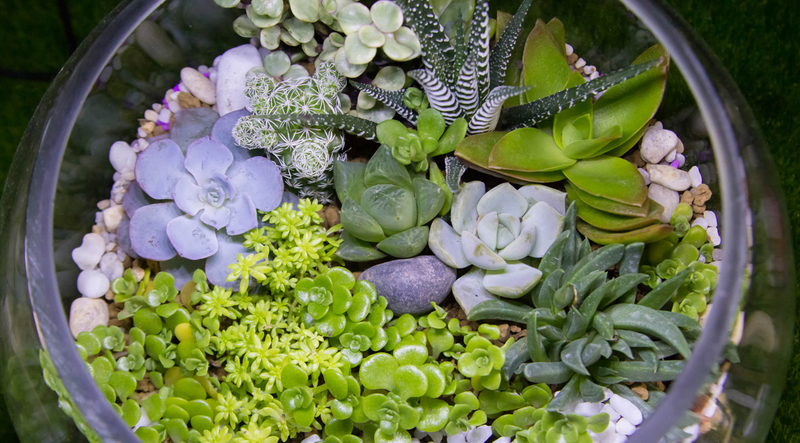 Introducing plants to your space will add a fresh, healthy feel. Enjoy!